Now there is a choice. 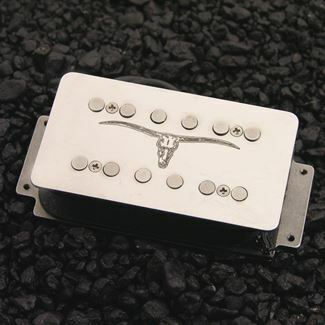 This fantastic neck replacement pickup for '72 and other oversized humbucking Tele's is the only one of it's kind available. Why? I recently bought and installed a set of the 72 Big Bottoms for my 72 tele. Here is my review: Holy f@ck is that some tone! Thanks for the fantastic product. With some simple wiring, I turned my factory Tele Deluxe into a Hella'caster. Nothing but kudos to Rio Grande. Containing one each of our Tallboy and Muy Grande '72 Wider Range humbuckings, this set is typically applied to early 70's Teles and their modern reisues.